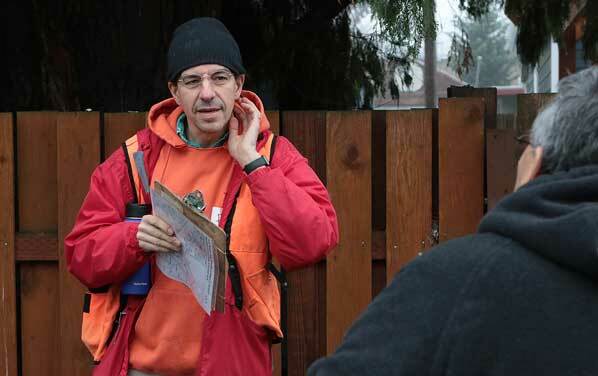 As the person in charge of “Logistics and Staging” for the Lents and Powellhurst-Gilbert Friends of Trees planting day, volunteer Don Crossley checks plant labels. 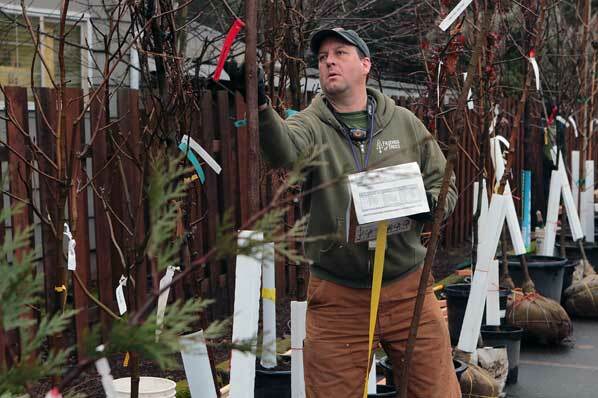 While the weather might be chilly, clammy, and dreary, trees love being planted this time of year. That’s why the Friends of Trees (FoT) organization hosts their “Volunteer Planting Parties” in the winter. The first planting day took place on the morning of January 19; others follow on January 26 and February 23. It may look like chaos, but the volunteers who staff the check-in tables quickly mark off the tree-planting volunteers, and direct them to their crew groups. Briefing Crew Leaders, who are also volunteers, is FoT Neighborhood Tree Specialist Litzy Venturi. 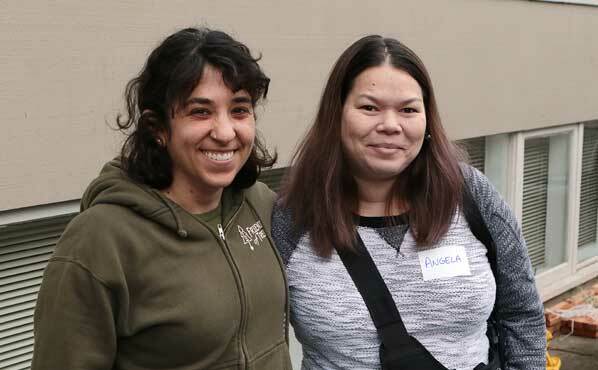 Many of the 150 volunteers who gathered at the Lents Gilbert Church of God for the first planting fueled up on donuts, bagels with cream cheese, and hot coffee, as they learned to which team they had been assigned. 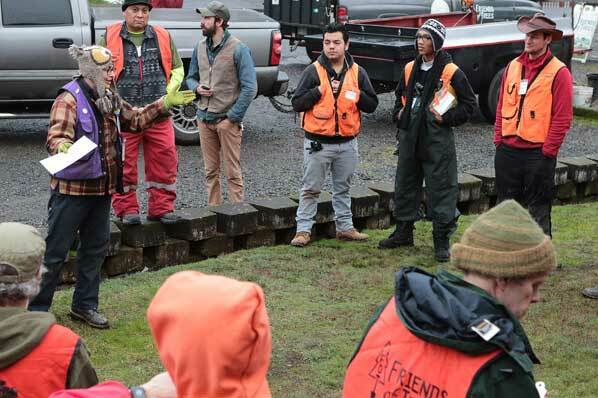 “This is, indeed, the kickoff for our 2019 outer East Portland tree planting season,” acknowledged Friends of Trees Neighborhood Tree Specialist Haley Miller, as she answered a constant stream of questions. FoT Neighborhood Tree Specialist Haley Miller spends a moment with volunteer and Powellhurst-Gilbert neighbor, Angela Cash, who says she’s also planting a new tree at her home that day. 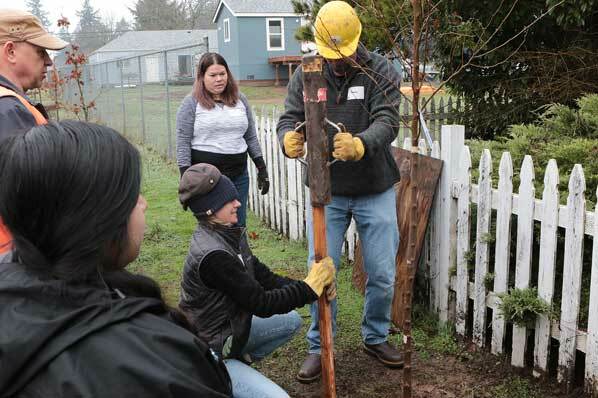 “Today, our crews will be planting about 135 trees – not only in Lents and Powellhurst-Gilbert, but also in the Pleasant Valley neighborhood,” Miller told East Portland News. Volunteer Crew Leader Paul Cone, who says he’s in his 15th season of planting these trees, occasionally drives by some of the 750 trees he’s helped plant over the years. 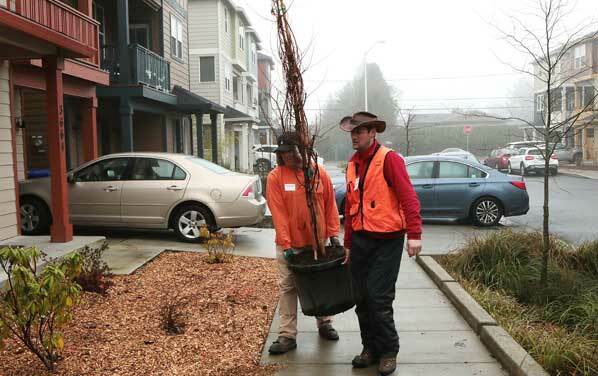 On SE 107th Avenue, north of Bush Street, Martin Getzinger and Crew Leader Orion Coleman from Ethos Tree Preservation carry in a taxodium distichum (bald cypress} tree – a deciduous conifer that seasonally loses its needles. “The work of our organization is important, because trees provide really great health benefits to neighbors everywhere,” opined Miller. “By getting trees out into neighborhoods – If people can’t easily access green spaces, they can at least have a tree in front of their house, or in their yard, to enjoy. “And, this season, we’re also planning a number of fruit trees! So, eventually, people will have fruit to eat off their trees, as well as enjoying their shade,” Miller pointed out. A few blocks away, on SE Pardee Street, FoT Crew Leaders Mike Ablutz and Ashlee Iverson admire this newly-planted plum tree. 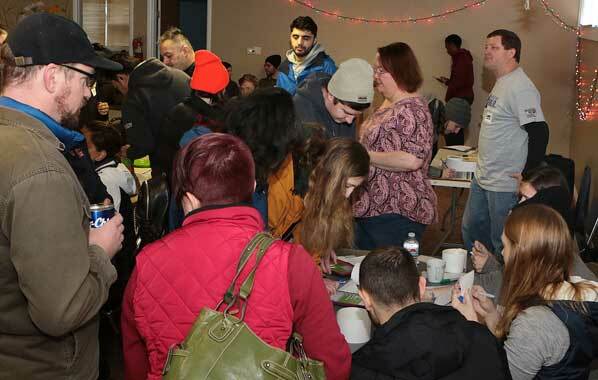 After the planting, the volunteers came back to the church for a hearty lunch, which included sandwiches prepared and donated by Zoiglhaus Brewery, and pizza pies from Bill Dayton’s Pizza Baron restaurant. 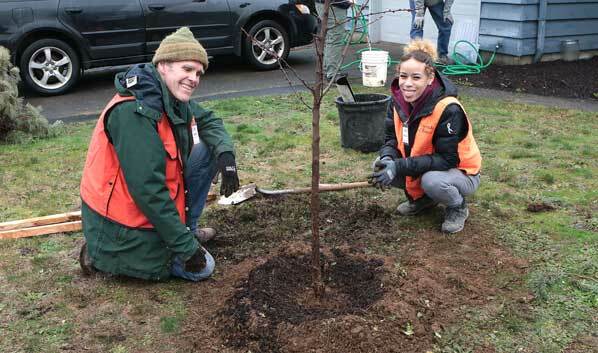 Volunteers Shawna Cozens and Steve Mayock plant another a tree during the event. This will be “Planting Day” for the Argay, Parkrose, Parkrose Heights, Russell, and Wilkes neighborhoods. The planting starts promptly at 9:00 a.m. and goes until noon. They provide gloves, tools, and guidance, so all you need to do is show up, dressed for the weather and wearing sturdy shoes or boots – and be ready to have fun! Neighborhood volunteers will provide a potluck lunch for all volunteers after the planting is complete. An RSVP is requested; CLICK HERE to open their Events Page, scroll down to this date, and click on the entry for more information. They’re meeting at Parkrose United Church of Christ, 12505 NE Halsey Street, (just east of the BiMart store), 97230. 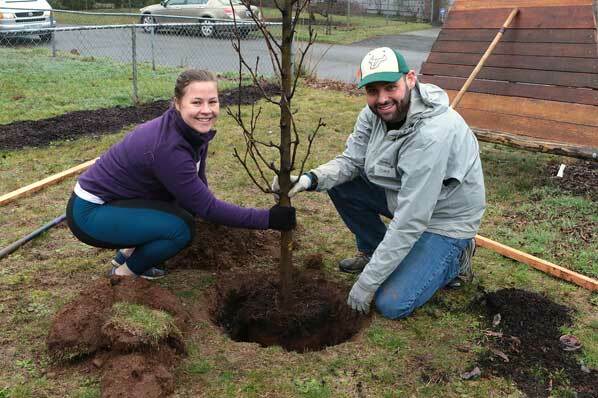 For more information, contact Jenny, Pablo or Carey at 503-595-0213 or email volunteer@friendsoftrees.org. Helping keep this newly-planted tree upright, volunteer Shawn Fackler pounds in a support stake.